Imagine my recent excitement when, while ‘playing’ on Google maps, a Coldwell Banker pop-up screen revealed a home sale listing for “Gaither’s Chance,” Clarksville, Maryland! Kismet! Needless to say, by the next morning my ever-helpful, very supportive hubby Mike was driving us there. This Gaither homestead was unknown to me. It is not the “Gaither’s Chance” of Prince George’s, now Montgomery County, Maryland, which was home of early Gaithers in the Benjamin line. Rather, the original 1747 patentee was billed as Samuel Gaither of Anne Arundel County, now Howard County, Maryland. WOW!!! Could it be that a Gaither home from 1747, unknown to me and in my home state was still standing? It was. It is. But, unfortunately, maybe not for long - - but, more on that later. It’s an amazing experience to stand on the very property that Samuel patented almost 300 years ago. 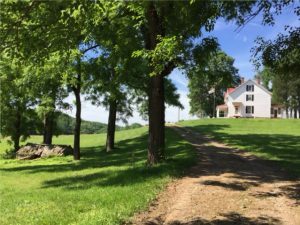 The current house is typical of a mid-19th century farmhouse, with one very important difference - - the 1700s two-room log cabin was incorporated into this farmhouse, with the original log walls and stone fireplace exposed! A Gaither family cemetery, original stone spring house, and stone foundations of many original outbuildings dot the property. The view from the house is of a lovely pond and rolling, wooded hills, as it would have appeared to Samuel in 1747. I was hooked! I had to find out more about the history of this property. So, where’s the very best place to start one’s research? I owe the confirmation of Gaither’s Chance’s ownership and history to our very-knowledgeable Gaither cousin Larry Campbell, and the fabulous “Disk” of hundreds of Gaither documents that he scanned for our use. Much of that material is from the genealogical files of Mel and Peggy Gaither. There it was, 32 pages of material related to “Samuel Gaither – Gaither’s Chance” - - the answer! From the All Hallows Parish Register, we know that Samuel Gaither was baptized April 7, 1717, Ann Arundel County, Maryland, son of John and Jane (Buck) Gaither. We also know from his Father John’s 1739 Will, that Samuel and brothers John and Edward inherited, and divided equally, 252-1/2 acres of “Left Out,” in Ann Arundel County, now Howard County, Maryland. On October 19, 1747, Samuel patented 50 acres, adjoining Left Out, which he named “Gaither’s Chance”. Samuel then expanded Gaither’s Chance in 1762 by an additional 50 acres. 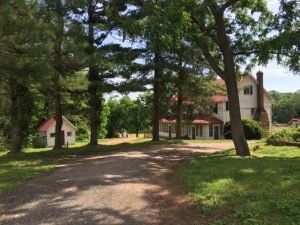 On a 1783 Tax Assessment, the year of Samuel’s death, Gaither’s Chance was valued at $75, and his homestead included the 100 acres of Gaither’s Chance, 4 horses, four black cattle, and 13 sheep. In his will, which was proved August 11, 1783, Samuel’s heirs were wife Ruth, daughter Nackey, and son Rezin, who inherited Gaither’s Chance. Rezin married Sarah and they lived on Gaither’s Chance with at least five children mentioned in his Will: daughter Achsah, and sons William, Elijah, Rezin, and Greenbury. The 1798 Tax Assessment for Gaither’s Chance indicates the dwelling was a 20x16 log house. By 1816, Gaither’s Chance was being divided among the 5 living children of Rezin and Sarah. Achsah, who married neighbor William Scrivener, sold her 1/5 share to brothers William and Greenbury. Elijah sold his share to brother William, while Rezin sold his share to brother Greenbury. So, by 1820, Gaither’s Chance had descended to two brothers William and Greenbury, from their Grandfather Samuel and Father Rezin. 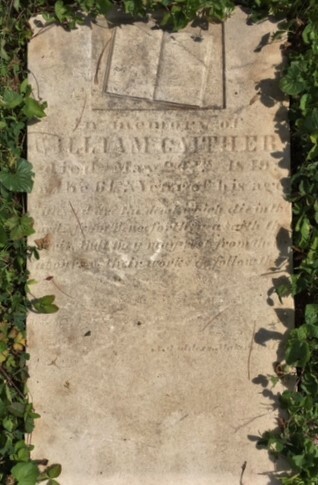 With regard to the family cemetery on the property, only two headstones remain: 1) William Gaither, who died May 24, 1849, “in the 61st year of his age;” (as best as can be determined on the worn tombstone) and, 2) the partial headstone of Samuel Close, b. 1765. He is likely, but not proven to be, the Father of Greenbury’s wife, Catherine Close. The "Disk" again proved so helpful. In Agnes D. Gaither’s file, there was a notation on her “Family Sheet” that “buried on the farm near Clarksville” were: Rezin Gaither, d. 29 December 1848; Rezin Gaither, Jr., d. 26 May 1868; James H. Gaither, died 19 February 1863; and, Mary Anne Gaither, d. 3 May 1870. 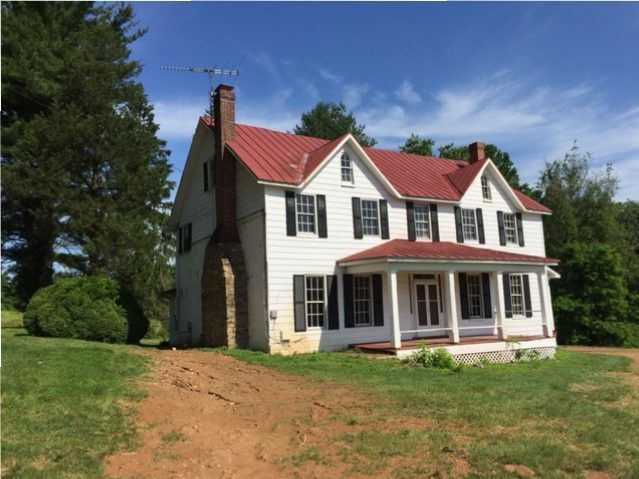 Now bent on contributing whatever may help preserve this very special property, I shared this information with the Howard County Planning and Zoning Office. A developer has subdivided the property into lots for new homes and is selling the old farmhouse, with acreage, separately. The new development will appropriately be named “Gaither’s Chance”. 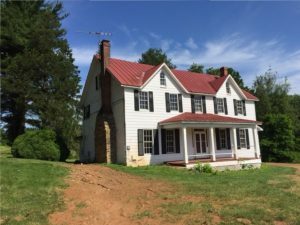 The farmhouse was already in the County’s database as a potential candidate for historic designation, but no designation has been made. 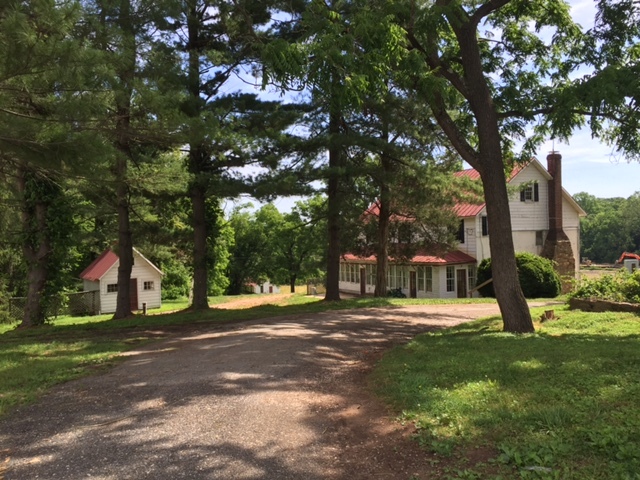 The County encourages preservation through tax benefits, but the laws do not prevent owners’ rights to significantly modify, or even tear down, homes such as Gaither’s Chance. The owner has control over whether to pursue a historic designation. 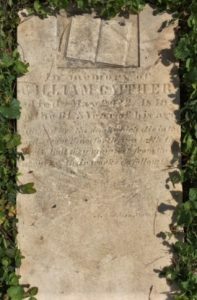 Thanks to the kismet of that pop-up screen, our Society can at least record this special property in our database and pursue official designation of the Gaither Family cemetery at Gaither’s Chance. Please let us know if you’re aware of others who may be buried there. I suspect Samuel is (b. 1717, d. 1783). Also, the information that Howard County’s Planning and Zoning Office now has in its files provides, for the record, a broader perspective and appreciation for the historical significance of “Gaither’s Chance”. Let us hope that the new owners will appreciate this very special property and, as caretakers of history, provide the loving attention that the old log walls, stone chimney, and other irreplaceable remnants of pre-Revolutionary life in America deserve! Sources: Where not otherwise cited, information about this property is taken from the research prepared by Joetta Koppenhoefer, December 1976, for the then-owner of “Gaither’s Chance”, Mr. Henry C. Marshall. We owe Ms. Koppenhoefer and Mr. Marshall a debt of gratitude for caring, preserving, and recording the history of “Gaither’s Chance”. That research paper and additional information from Gaither family members is from the Disk compiled by Larry Campbell under: “Samuel Gaither – Gaither’s Chance”. WOW! What a fabulous find! I went online to see if I could find the house through Coldwell Bankers (CB) website and it said it was no longer available. Were you able to go inside? Were their photos on line with CB? I’d love for us to be able to preserve that as well. Thanks Nancy for your interest and all the research you do and share with the Society.